This post feels so good to write! 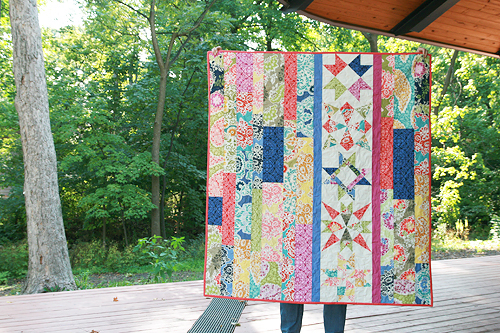 Last winter I hosted a quilt along on my blog called the Solstice Stars Series (see tab at the top of my blog). I wanted to make a quilt that focused on traditional stars, but arrange them in a non-traditional way. I purposely only made 5 stars so we would all be a bit forced to think outside of the box regarding the quilt layout. My quilt top has been sitting finished for months. 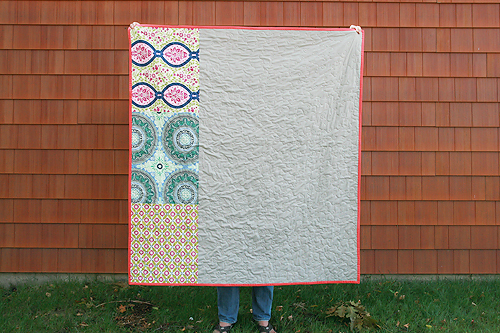 I wasn't sure how I wanted to quilt it...I had some dreams of hand quilting. But last week I decided to face reality, it was not going to happen. I feel like every second of my day is filled up and I really wanted to finish this quilt. So I decided to try one of the free motion quilting techniques in Angela's new book, a double loop. I'm really pleased with how the quilt turned out. I love the colors (the fabric is Secret Garden by Sandi Henderson). 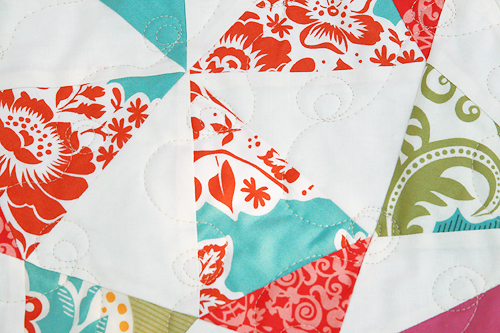 The scrappy part of the quilt is similar to my Good Folks Scrappy quilt. You basically just cut strips of varying widths and sew them in columns. Then you sew the columns together until you have your desired width of quilt top. 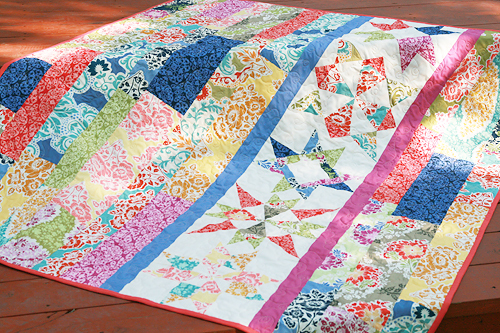 The back is a mixture of a solid I had around the house and left over fat quarters from the Secret Garden line. The binding is Free Spirit Designer Solid Flamingo. 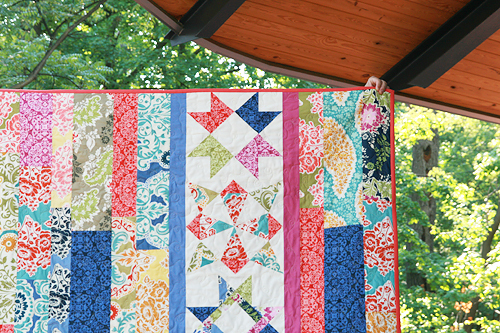 The final quilt measures 54" x 60". You can find links to all the star tutorials as well as more layout ideas on the Solstice Stars Series tab at the top of my blog.